I could seriously live on roasted veggies. 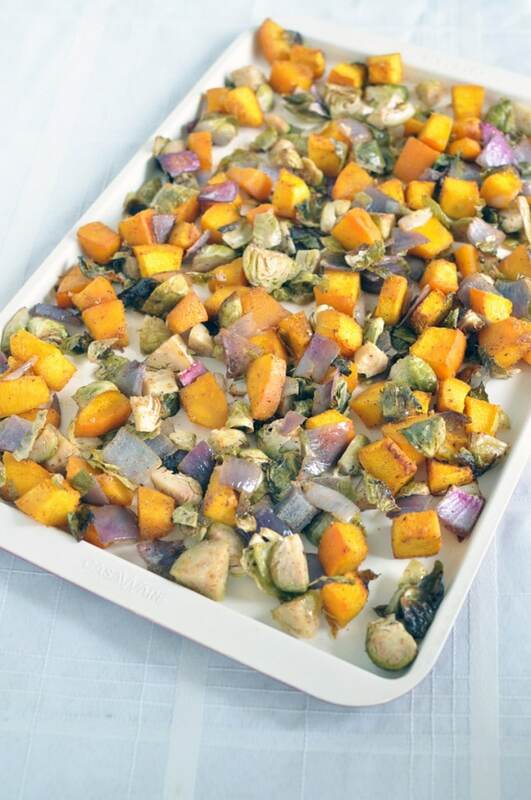 Since we are in Fall now, my husband decided to create this recipe for Roasted Pumpkin and Brussels Sprouts. There just aren’t enough savory pumpkin recipes out there. Don’t get me wrong, I love the sweet pumpkin recipes, but it’s nice to switch it up with a savory version now and again. This could be a perfect side dish for your holiday parties. Or just serve it anytime. To make a complete meal, you can add chickpeas or serve over quinoa. Mix all the ingredients, minus the pepitas, in a bowl until everything is well-coated. Put in a pan and roast in the oven at 375 for approx. 50 minutes. Add in pepitas the last 10 minutes if adding into recipe. This should last 5 days in the fridge. Enjoy! I could honestly eat roasted veggies for every meal. Better than candy!! If I was going to substitute butternut squash or sweet potato, how many cups of cubed squash/potato should I use? My guess would be 2? Hello Melissa! This looks awesome! :) I noticed the white cookie sheet/pan. Is it a special one? Made this tonight and it was amazing! Thank you for sharing! Awesome! So glad you liked it Brandon! I love savoury pumpkin recipes! And Im sure that this one will be no exception!